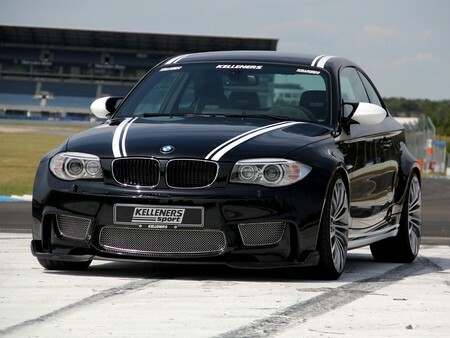 The first full tuning package for the BMW 1-Series M Coupe comes from Kelleners Sport, and it’s a good one. Starting with the looks, the car has been given a new spoiler lip, new mesh grilles and wing, and amazing graphics in contrasting color. It also gets 20-inch polished graphite-silver, polished platinum-silver and matt black rims. The high-revving inline six-cylinder engine with twin-turbochargers boosts the output of the KS Power SW 35M by a good 20 percent. Instead of the standard 340 hp (250 kW), the KS1-S produces max. 410 hp (301 kW) while max torque jumps from 450 to 550 Nm. The result is a decline in weight to power ratio from 4.4 to 3.8 kg per hp. Upgraded exhausts, suspension, and a magnificent interior finish off the package. he sports steering wheel is fitted with Alcantara applications. Additionally, the gear lever and hand brake boots are made of Alcantara. You also get white gloss accents and aluminum pedals.